Two months after the Carlsbad desalination plant came online, the San Diego County Water Authority (SDCWA), the sole buyer of the plant’s water, directed half a billion gallons of recently desalinated water to a lake near Chula Vista, where it must be re-treated before entering distribution pipelines. This order came as result of the region’s overabundance of water supply; the county already had 99% of the water needed for normal usage since November 2015. Additionally, the statewide conservation mandate lowered the demand further. By January 2016, a few weeks after the Carlsbad plant began operation, the SDCWA asked the Metropolitan Water District (Metropolitan), its main wholesale water supplier, to stop deliveries. However, Metropolitan responded that it was technically infeasible to do so without making physical changes to its pipelines. Restrictive terms of contract with the company that owns the Carlsbad desalination plant, Poseidon Resources, also prevented the SDCWA from buying less of the expensive desalinated water. Currently, the cost of Carlsbad plant’s desalinated water is at least $2,131 per acre-foot, while Metropolitan-treated water is about $942 per acre-foot and the SDCWA’s own water treatment facility’s water is $830 per acre-foot. The SDCWA expects desalination costs to be lower than water imports from Metropolitan between 2027 and 2042. A series of questions emerged from the unfolding of this event. Is desalination an appropriate solution for California’s water problems? How are conservation efforts affected by a financial lock-in of desalinated water purchase? What are the tradeoffs between supply reliability and cost burden on ratepayers? And are those tradeoffs justifiable given alternative supply options? Australia may be able to provide a few key lessons. Over the course of its decade-long drought period, the nation built six large seawater desalination plants ranging in size from 35 million to 120 million gallons per day. Four of those plants have been mothballed since the end of the drought, including Victoria’s $4 billion plant, the nation’s largest desalination facility. Perhaps, California should be more wary of desalination development, and follow Australia’s footsteps in urban and agricultural water conservation, water recycling, and stormwater capture, which are cost-effective and environmentally-benign solutions that remain useful in times of uncertainty. The California State Water Board adopted a revised emergency regulation on urban water conservation through October 2016. Under the revised regulation, the statewide water conservation goal is to exceed 20% of 2013 water use. It takes into consideration factors that influence water use in different parts of the state, such as the hotter-than-average climate, population growth, and significant investments in new local, drought resilient water supplies such as water recycling and desalination. Cumulative urban water use reduction for June to the end of 2015 is currently at 25.5%. Monthly conservation fell to 18.3% in December. Despite a decline in the urban water conservation rate in the late fall and winter months, California continues to meet its overall reduction target of 25% of 2013 levels, or about 1.2 million acre-feet annually. NOAA forecasts a El Niño weakening through spring with conditions potentially transitioning to La Niña this coming fall. However, considerable uncertainty remains. For California, where El Niño effects are typically delayed, the National Weather Service’s Sacramento office said that El Niño is taking a five to ten day break due to high pressure, bubble-like system currently blocking incoming storms. A new study, published in Geophysical Research Letters, found that drier conditions are becoming a new normal for southwestern states. Analyzing 35 years of data, researchers identified weather patterns that are typical in the contiguous US and determined whether those patterns are becoming more or less frequent. Results suggested that the Southwest, and especially California, has experienced between 2.0% to 6.5% reduction in precipitation per decade between 1980 and 2010. Despite the ongoing drought, California farms had record sales in 2014, according to a new state report. Total agricultural sales were about $54 billion, a 5.1% increase over the 2013 level. Experts cite two key reasons for this strong performance: California almond export boom and the ability of farmers to tap into deeper, bigger wells. A new study shows reduced hydroelectric generation during the California drought, resulting in increased electricity costs and greenhouse gas emissions from a shift to other energy sources. Production decreased to 7% of the state’s electricity needs in the 2015 water year, compared to 18% in an average year. Areas severely affected by the drought continue to shrink. As of February 9, 38.48% of the state is in exceptional drought, compared to 44.84% three months ago. 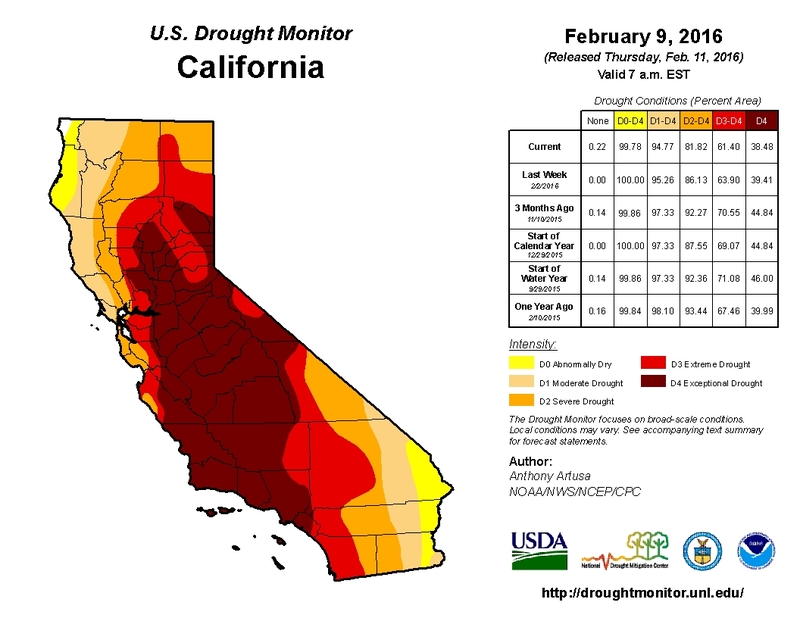 The drought situation is still serious despite heavy rainfall in January. 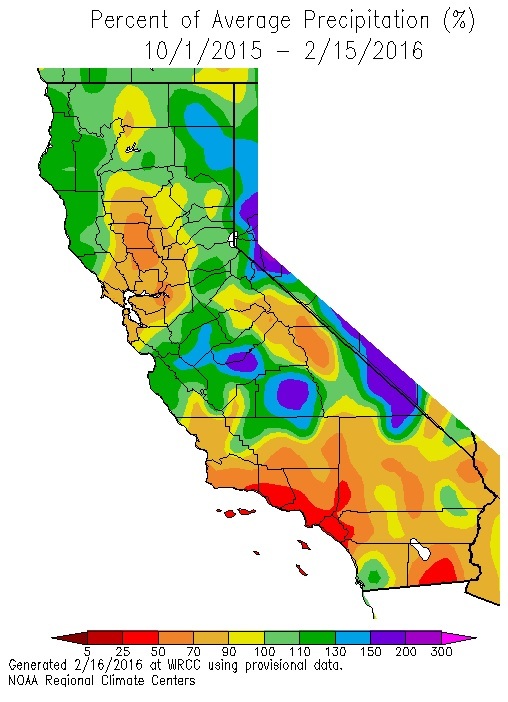 Snow-water content and rainfall appear to be following an average year pattern (see the Daily Regional Snowpack Plot and the Northern Sierra, San Joaquin, and Tulare Basin precipitation index charts). Clear weather and warm temperatures over the long weekend have led to a decrease in snow-water content, which is now 91% of the normal level for February 16. 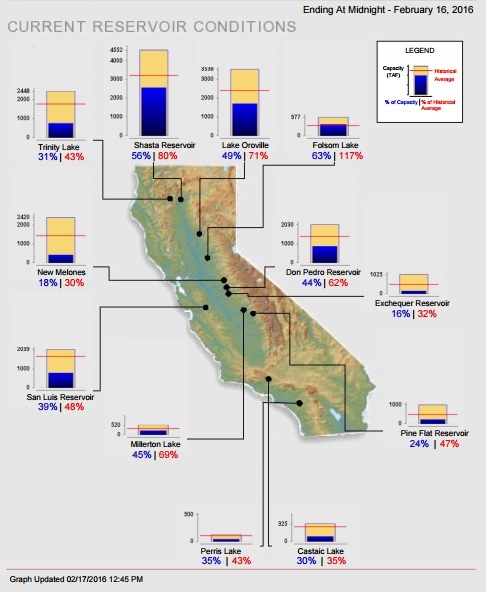 Water levels in California’s major reservoirs (representing 27.3 million acre-feet of storage) have increased to 40% of statewide capacity, compared to 35% two weeks ago. These levels represent 62% of group historical average, and 91% of what they were last year. Major reservoirs such as Lake Oroville, Shasta, and Folsom are now at 71%, 80%, and 116% of historical average, respectively.